Enjoy this guest post from fellow blogger Sandra Cobain. Kids need plenty of exercise for good health. It’s a no brainer, right? Along with preventing health complications from obesity, exercise has a ton of benefits including strong bones, better endurance, deeper sleep, better focus, less stress and an improved mental health, among others. So how do you get your kids to exercise? Probably not by taking them to the gym and putting them on a treadmill. I doubt they’ll get excited about that. Activities that are fun will win their enthusiastic cooperation, and there’s no need to mention that it’s exercise. They’ll think it’s pure play, and kids love to play. No need to break the bank paying for summer camp either, there are plenty of free ways to get kids moving. Here are 10 ideas to get kids active for the family on a budget, some of which the whole family can enjoy. These 10 ideas are just the beginning. You can also look for ways to modify the ideas listed here in ways that will help you have even more fun. With playgrounds and plenty of grassy space to roam, the possibilities for play at the park are limited only by your child’s imagination. Try this if you want to get out of the house but don’t want to spend any money doing it. You could even leave the car at home and walk to the park, which would add to the workout in disguise. Walking to the park is a great way for you to burn some calories too. Hiking is a great workout, and kids love to explore nature. From the bugs they find to the wonder of what may be just ahead, this is an activity the kids will get a big kick out of. Try this fun way to lower your kids’ risk of heart disease and high blood pressure. This is also a great way for the adults to get some exercise in as well. It’s a very family friendly way to workout, and can be a good time for everyone. Kids love hide and seek, and this is a great way to help them develop agility, balance and coordination. This is a game you can play too! Just tell your kids that you’ll count to whatever number you choose, and they have to hide while you’re counting, and if they are found they’re it. You can have a lot of fun together! Dancing is one of the best forms of aerobic exercise there is, and most kids enjoy it. Benefits include improved muscle tone, stronger bones, weight management, flexibility and improved mental functioning. Just put on some music and let your little ones go wild. If you’re in the mood to groove, you can also join in on the fun too. Swimming has many benefits, including managing weight, boosting mood, strengthened muscles, and improved sleep. 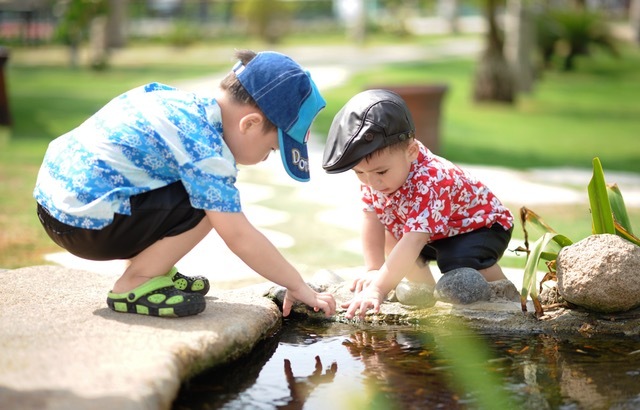 Kids love to play in water, and they will happily spend hours doing it. In many communities, sponsored swimming is available for free. Do a quick Google search to see what’s available near you, then head to the pool. You could even get in the water if you are up for a swim, it’s something you may enjoy too. Kids naturally make up games to play, and love playing outside. Try this if you don’t feel like going anywhere but want to get your kids moving. All you have to do is open the door and let them scurry out and use their imagination. Playing in the dirt is a fun pastime for kids. Along with being moderate exercise, gardening also improves mood, focus, memory and overall sense of psychological well being. Avoid giving them access to potentially dangerous tools like pressure washers, though. Teach them about the plants as you go to encourage learning as well. This will not only benefit them, but also benefit you by giving you beautiful flowers, or tasty vegetables to eat. This fun game has many surprising health benefits, including stress relief, learning teamwork, and sharpening navigational skills. Hide little treasures around the house and in the yard for an exciting game of treasure hunting. You’ll enjoy watching your kids’ faces light up as they discover little prizes. This is a good way to get your kids jumping with excitement, literally. Just lay down couch cushions on the floor and tell them the floor is lava, and that they don’t want to touch it. Then, you can just sit back and relax while they “hop to it,” pun intended. Beaches are sort of like a park mixed with a swimming pool. Not only can they splash around in the water, they can also play in the sand with some beach toys. You will also enjoy it too, the beach is a relaxing way to unwind for adults. It’s a great free outing for the whole family. Being on a budget doesn’t mean your kids can’t be healthy and have fun. Indoors or outdoors, there are plenty of activities to keep them happy and in good shape. Thanks for stopping by, and I wish your family good times and good health. Author Bio: Sandra Cobain is the editor-in-chief of BestForTheKids, a website geared towards helping parents find the best stuff (whether it’s parenting advice or even toys) for their kids. Sandra is the mum of two young, playful and enthusiastic kids. She used to be a practicing child psychologist before taking up her editorial duties.